The rainbow trout (Oncorhynchus mykiss) is a trout and species of salmonid native to cold-water tributaries of the Pacific Ocean in Asia and North America. The steelhead (sometimes called "steelhead trout") is an anadromous (sea-run) form of the coastal rainbow trout (O. m. irideus) or Columbia River redband trout (O. m. gairdneri) that usually returns to fresh water to spawn after living two to three years in the ocean. Freshwater forms that have been introduced into the Great Lakes and migrate into tributaries to spawn are also called steelhead. Wild-caught and hatchery-reared forms of this species have been transplanted and introduced for food or sport in at least 45 countries and every continent except Antarctica. Introductions to locations outside their native range in the United States (U.S.), Southern Europe, Australia, New Zealand and South America have damaged native fish species. Introduced populations may affect native species by preying on them, out-competing them, transmitting contagious diseases (such as whirling disease), or hybridizing with closely related species and subspecies, thus reducing genetic purity. The rainbow trout is included in the list of the top 100 globally invasive species. Nonetheless, other introductions into waters previously devoid of any fish species or with severely depleted stocks of native fish have created sport fisheries such as the Great Lakes and Wyoming's Firehole River. Some local populations of specific subspecies, or in the case of steelhead, distinct population segments, are listed as either threatened or endangered under the Endangered Species Act. The steelhead is the official state fish of Washington. The scientific name of the rainbow trout is Oncorhynchus mykiss. The species was originally named by German naturalist and taxonomist Johann Julius Walbaum in 1792 based on type specimens from the Kamchatka Peninsula in Siberia. Walbaum's original species name, mykiss, was derived from the local Kamchatkan name used for the fish, mykizha. The name of the genus is from the Greek onkos ("hook") and rynchos ("nose"), in reference to the hooked jaws of males in the mating season (the "kype"). Sir John Richardson, a Scottish naturalist, named a specimen of this species Salmo gairdneri in 1836 to honor Meredith Gairdner, a Hudson's Bay Company surgeon at Fort Vancouver on the Columbia River who provided Richardson with specimens. In 1855, William P. Gibbons, the curator of Geology and Mineralogy at the California Academy of Sciences, found a population and named it Salmo iridia (Latin: rainbow), later corrected to Salmo irideus. These names faded once it was determined that Walbaum's description of type specimens was conspecific and therefore had precedence. In 1989, morphological and genetic studies indicated that trout of the Pacific basin were genetically closer to Pacific salmon (Oncorhynchus species) than to the Salmos – brown trout (Salmo trutta) or Atlantic salmon (Salmo salar) of the Atlantic basin. Thus, in 1989, taxonomic authorities moved the rainbow, cutthroat and other Pacific basin trout into the genus Oncorhynchus. Walbaum's name had precedence, so the species name Oncorhynchus mykiss became the scientific name of the rainbow trout. The previous species names irideus and gairdneri were adopted as subspecies names for the coastal rainbow and Columbia River redband trout, respectively. Anadromous forms of the coastal rainbow trout (O. m. irideus) or redband trout (O. m. gairdneri) are commonly known as steelhead. Subspecies of Oncorhynchus mykiss are listed below as described by fisheries biologist Robert J. Behnke (2002). Coastal forms Coastal rainbow trout O. m. irideus (Gibbons, 1855) Pacific Ocean tributaries from Aleutian Islands in Alaska south to Southern California. Anadromous forms are known as steelhead, freshwater forms as rainbow trout. Redband forms Columbia River redband trout O. m. gairdneri (Richardson, 1836) Found in the Columbia River and its tributaries in Montana, Washington and Idaho. Anadromous forms are known as redband steelhead. McCloud River redband trout O. m. stonei (Jordan, 1894) Native to the McCloud River, upstream of Middle Falls, and its tributaries in Northern California, south of Mount Shasta. Sheepheaven Creek redband trout O. m. spp. Native to Sheepheaven Creek, Siskiyou County, California. Sheepheaven Creek redband were transplanted into Swamp Creek in 1972 and 1974 and into Trout Creek in 1977. Great Basin redband trout O. m. newberrii (Girard, 1859) Native in southeastern Oregon and parts of California and Nevada on the periphery of the Great Basin. Eagle Lake trout O. m. aquilarum (Snyder, 1917) Endemic to Eagle Lake in Lassen County, California. Kamloops rainbow trout O. m. kamloops strain (Jordan, 1892) Native to several large British Columbia lakes, particularly Kamloops Lake and Kootenay Lake. Known for its very large size. Kern River golden trout Golden trout O. m. aguabonita (Jordan, 1892) Native to Golden Trout Creek (tributary to the Kern River), Volcano Creek (tributary to Golden Trout Creek), and the South Fork Kern River. Kern River rainbow trout O. m. gilberti (Jordan, 1894) Endemic to the Kern River and tributaries in Tulare County, California. Its current range is drastically reduced from its historic range. Remnant populations live in the Kern River above Durrwood Creek, in upper Ninemile, Rattlesnake and Osa creeks, and possibly in upper Peppermint Creek. Little Kern golden trout O. m. whitei (Evermann, 1906) Endemic to about 100 miles (160 km) of the Little Kern River and tributaries. Their current range is restricted to five headwater streams in the Kern River basin (Wet Meadows, Deadman, Soda Spring, Willow, Sheep and Fish creeks) plus an introduced population in Coyote Creek, a tributary of the Kern River. *Rio del Presidio trout O. m. nelsoni (Evermann, 1908) Sometimes referred to as Nelson's trout, occurs in three distinct geographic groups. The taxonomy of these trout is subject to ongoing research and there may be significant diversity of forms in this group. Palomino trout So-called golden rainbow trout or palomino trout are bred from a single mutated color variant of O. mykiss that originated in a West Virginia fish hatchery in 1955. Golden rainbow trout are predominantly yellowish, lacking the typical green field and black spots but retaining the diffuse red stripe. The palomino trout is a mix of golden and common rainbow trout, resulting in an intermediate color. The golden rainbow trout is not the same subspecies as the naturally occurring O. m. aguabonita, the Kern River golden trout of California. Resident freshwater rainbow trout adults average between 1 and 5 lb (0.5 and 2.3 kg) in riverine environments, while lake-dwelling and anadromous forms may reach 20 lb (9 kg). Coloration varies widely between regions and subspecies. Adult freshwater forms are generally blue-green or olive green with heavy black spotting over the length of the body. Adult fish have a broad reddish stripe along the lateral line, from gills to the tail, which is most pronounced in breeding males. The caudal fin is squarish and only mildly forked. Lake-dwelling and anadromous forms are usually more silvery in color with the reddish stripe almost completely gone. Juvenile rainbow trout display parr marks (dark vertical bars) typical of most salmonid juveniles. In some redband and golden trout forms parr marks are typically retained into adulthood. Some coastal rainbow trout (O. m. irideus) and Columbia River redband trout (O. m. gairdneri) populations and cutbow hybrids may also display reddish or pink throat markings similar to cutthroat trout. In many regions, hatchery-bred trout can be distinguished from native trout via fin clips. Fin clipping the adipose fin is a management tool used to identify hatchery-reared fish. Rainbow trout, including steelhead forms, generally spawn in early to late spring (January to June in the Northern Hemisphere and September to November in the Southern Hemisphere) when water temperatures reach at least 42 to 44 °F (6 to 7 °C). The maximum recorded lifespan for a rainbow trout is 11 years. Freshwater resident rainbow trout usually inhabit and spawn in small to moderately large, well oxygenated, shallow rivers with gravel bottoms. They are native to the alluvial or freestone streams that are typical tributaries of the Pacific basin, but introduced rainbow trout have established wild, self-sustaining populations in other river types such as bedrock and spring creeks. Lake resident rainbow trout are usually found in moderately deep, cool lakes with adequate shallows and vegetation to support production of sufficient food sources. Lake populations generally require access to gravelly bottomed streams to be self-sustaining. Spawning sites are usually a bed of fine gravel in a riffle above a pool. A female trout clears a redd in the gravel by turning on her side and beating her tail up and down. Female rainbow trout usually produce 2000 to 3000 4-to-5-millimetre (0.16 to 0.20 in) eggs per kilogram of weight. During spawning, the eggs fall into spaces between the gravel, and immediately the female begins digging at the upstream edge of the nest, covering the eggs with the displaced gravel. As eggs are released by the female, a male moves alongside and deposits milt (sperm) over the eggs to fertilize them. The eggs usually hatch in about four to seven weeks although the time of hatching varies greatly with region and habitat. Newly hatched trout are called sac fry or alevin. In approximately two weeks, the yolk sac is completely consumed and fry commence feeding mainly on zooplankton. The growth rate of rainbow trout is variable with area, habitat, life history and quality and quantity of food. As fry grow, they begin to develop "parr" marks or dark vertical bars on their sides. In this juvenile stage, immature trout are often called "parr" because of the marks. These small juvenile trout are sometimes called fingerlings because they are approximately the size of a human finger. In streams where rainbow trout are stocked for sport fishing but no natural reproduction occurs, some of the stocked trout may survive and grow or "carryover" for several seasons before they are caught or perish. The oceangoing (anadromous) form, including those returning for spawning, are known as steelhead in Canada and the U.S. In Tasmania they are commercially propagated in sea cages and are known as ocean trout, although they are the same species. Like salmon, steelhead return to their original hatching grounds to spawn. Similar to Atlantic salmon, but unlike their Pacific Oncorhynchus salmonid kin, steelhead are iteroparous (able to spawn several times, each time separated by months) and make several spawning trips between fresh and salt water, although fewer than 10 percent of native spawning adults survive from one spawning to another. The survival rate for introduced populations in the Great Lakes is as high as 70 percent. As young steelhead transition from freshwater to saltwater, a process called "smoltification" occurs where the trout undergoes physiological changes to allow it to survive in sea water. There are genetic differences between freshwater and steelhead populations that may account for the smoltification in steelheads. Juvenile steelhead may remain in the river for one to three years before smolting and migrating to sea. Individual steelhead populations leave the ocean and migrate into their freshwater spawning tributaries at different times of the year. Two general forms exist—"summer-run steelhead" and "winter-run steelhead". Summer-run fish leave the ocean between May and October, before their reproductive organs are fully mature. They mature in fresh water while en route to spawning grounds where they spawn in the spring. Summer-run fish generally spawn in longer, more inland rivers such as the Columbia River. Winter-run fish are ready to spawn when they leave the ocean, typically between November and April, and spawn shortly after returning to fresh water. Winter-run fish generally spawn in shorter, coastal rivers typically found along the Olympic Peninsula and British Columbia coastline, and summer-run fish are found in some shorter, coastal streams. Once steelhead enter riverine systems and reach suitable spawning grounds, they spawn just like resident freshwater rainbow trout. Rainbow trout are predators with a varied diet and will eat nearly anything they can capture. They are not as piscivorous or aggressive as brown trout or chars. Rainbow trout, including juvenile steelhead in fresh water, routinely feed on larval, pupal and adult forms of aquatic insects (typically caddisflies, stoneflies, mayflies and aquatic diptera). They also eat fish eggs and adult forms of terrestrial insects (typically ants, beetles, grasshoppers and crickets) that fall into the water. Other prey include small fish up to one-third of their length, crayfish, shrimp, and other crustaceans. As rainbow trout grow, the proportion of fish consumed increases in most populations. Some lake-dwelling forms may become planktonic feeders. In rivers and streams populated with other salmonid species, rainbow trout eat varied fish eggs, including those of salmon, brown and cutthroat trout, mountain whitefish and the eggs of other rainbow trout. Rainbows also consume decomposing flesh from carcasses of other fish. Adult steelhead in the ocean feed primarily on other fish, squid and amphipods. The native range of Oncorhynchus mykiss is in the coastal waters and tributary streams of the Pacific basin, from the Kamchatka Peninsula in Russia, east along the Aleutian Islands, throughout southwest Alaska, the Pacific coast of British Columbia and southeast Alaska, and south along the west coast of the U.S. to northern Mexico. It is claimed that the Mexican forms of Oncorhynchus mykiss represent the southernmost native range of any trout or salmon (Salmonidae), though the Formosan landlocked salmon (O. masou formosanus) in Asia inhabits a similar latitude. The range of coastal rainbow trout (O. m. irideus) extends north from the Pacific basin into tributaries of the Bering Sea in northwest Alaska, while forms of the Columbia River redband trout (O. m. gairdneri) extend east into the upper Mackenzie River and Peace River watersheds in British Columbia and Alberta, Canada, which eventually drain into the Beaufort Sea, part of the Arctic Ocean. Since 1875, the rainbow trout has been widely introduced into suitable lacustrine and riverine environments throughout the United States and around the world. Many of these introductions have established wild, self-sustaining populations. Since 1870, rainbow trout have been artificially propagated in fish hatcheries to restock streams and to introduce them into non-native waters. The first rainbow trout hatchery was established on San Leandro Creek, a tributary of San Francisco Bay, in 1870, and trout production began in 1871. The hatchery was stocked with the locally native rainbow trout, and likely steelhead of the coastal rainbow trout subspecies (O. m. irideus). The fish raised in this hatchery were shipped to hatcheries out of state for the first time in 1875, to Caledonia, New York, and then in 1876 to Northville, Michigan. In 1877, another California rainbow trout hatchery, the first federal fish hatchery in the National Fish Hatchery System, was established on Campbell Creek, a McCloud River tributary. The McCloud River hatchery indiscriminately mixed coastal rainbow trout eggs with the eggs of local McCloud River redband trout (O. m. stonei). Eggs from the McCloud hatchery were also provided to the San Leandro hatchery, thus making the origin and genetic history of hatchery-bred rainbow trout somewhat diverse and complex. In the U.S., there are hundreds of hatcheries operated by the U.S. Fish and Wildlife Service and various state agencies and tribal governments propagating rainbow trout for conservation and recreational sport fishing. Six of ten Canadian provinces have rainbow trout farms, with Ontario leading production. Rainbow trout are commercially farmed in many countries throughout the world. The practice began in the late 19th century, and since the 1950s commercial production has grown dramatically. Worldwide, in 2007, 604,695 tonnes (595,145 long tons; 666,562 short tons) of farmed rainbow trout were harvested with a value of about US $2.6 billion. The largest producer is Chile. In Chile and Norway, sea cage production of steelhead has expanded to supply export markets. Inland production of rainbow trout to supply domestic markets has increased in countries such as Italy, France, Germany, Denmark and Spain. Other significant trout-producing countries include the U.S., Iran, the United Kingdom, and Lesotho. While the U.S. rainbow trout industry as a whole is viewed as ecologically responsible, trout raised elsewhere are not necessarily farmed with the same methods. About three-quarters of U.S. production comes from Idaho, particularly the Snake River area, due in part to the quality and temperature of the water available there. California and Washington also produce significant numbers of farmed trout. In the east, Pennsylvania, North Carolina and West Virginia have farming operations. Rainbow trout farming is one of the largest finfish aquaculture industries in the U.S. They are raised inland in facilities where raceways or ponds have continuously flowing water with little pollution and a low risk of escape. The U.S. industry is noted for using best management practices. Imports constitute only about 15 percent of farmed rainbows sold in the U.S., and nearly all domestic production is consumed within the country; very little is exported. The U.S. produces about 7 percent of the world's farmed trout. Rainbow trout, especially those raised in farms and hatcheries, are susceptible to enteric redmouth disease. A considerable amount of research has been conducted on redmouth disease, given its serious implications for rainbow trout farming. The disease does not infect humans. Populations of many rainbow trout subspecies, including anadromous forms (steelhead) of O. m. irideus (coastal rainbow trout) and O. m. gairdneri (Columbia River redband trout) have declined in their native ranges due to over-harvest, habitat loss, disease, invasive species, pollution and hybridization with other subspecies, and some introduced populations, once healthy, have declined for the same reasons. As a consequence, some rainbow populations, particularly anadromous forms within their native range, have been classified as endangered, threatened or species of special concern by federal or state agencies. Rainbow trout, and subspecies thereof, are currently a U.S. Environmental Protection Agency-approved indicator species for acute fresh water toxicity testing. Many non-profit organizations have formed to protect, conserve and restore native rainbow trout and steelhead populations. Generally, in partnership with various universities, state, federal and tribal agencies and private interests, these organizations sponsor projects to restore habitat, prevent habitat loss and promote awareness of threats to native trout populations. Trout Unlimited (TU) is a non-profit organization dedicated to the conservation of North American freshwater streams, rivers, and associated upland habitats for trout, salmon, other aquatic species and people. A typical TU project is the Circle Creek Fish Passage Project, in which access to a spawning stream is being improved for steelhead and other salmonid species. The Wild Salmon Center, an international coalition of Russian, Canadian and U.S. scientists, sponsors the Kamchatka Steelhead Project, a 20-year (1994–2014) scientific program to study and conserve the present condition of Kamchatkan steelhead ("mikizha"), a species listed in the Red Data Book of Russia. Other high-profile organizations involved in rainbow trout conservation include California Trout, which protects wild trout and other salmonids in the waters of California. The Steelhead Society of British Columbia promotes the wellbeing of wild salmonids in British Columbia. In 1997, a group of approximately 40 ichthyologists, biologists and naturalists from several U.S. and Mexican institutions formed a collaborative group—Truchas Mexicanas—to study the diversity of Mexican native trout, most of which are considered subspecies of O. mykiss. Rainbow trout, primarily hatchery-raised fish of the coastal rainbow trout subspecies (O. m. irideus) introduced into waters inhabited with cutthroat trout, will breed with cutthroats and produce fertile hybrids called cutbows. In the case of the westslope cutthroat trout (O. clarki lewisi), hybridization with introduced rainbow and Yellowstone cutthroat trout (O. clarki bouvieri) is threatening the westslope cutthroat trout with genomic extinction. Such introductions into the ranges of redband trout (O. m. gairdneri, newberrii, and stonei) have severely reduced the range of pure stocks of these subspecies, making them "species of concern" in their respective ranges. Within the range of the Kern River golden trout of Southern California, hatchery-bred rainbows introduced into the Kern River have diluted the genetic purity of the Kern River rainbow trout (O. m. gilberti) and golden trout (O. m. aguabonita) through intraspecific breeding. The Beardslee trout, (O. m. irideus var. beardsleei), a genetically unique lake-dwelling variety of the coastal rainbow trout that is isolated in Lake Crescent (Washington), is threatened by the loss of its only spawning grounds in the Lyre River to siltation and other types of habitat degradation. Myxobolus cerebralis is a myxosporean parasite of salmonids (salmon, trout, and their allies) that causes whirling disease in pen farmed salmon and trout and also in wild fish populations. It was first described in rainbow trout introduced to Germany a century ago, but its range has spread and it has appeared in most of Europe, northern Asia, the U.S., South Africa and other countries. In the 1980s, M. cerebralis was found to require Tubifex tubifex (a kind of segmented worm) to complete its life cycle. The parasite infects its hosts with its cells after piercing them with polar filaments ejected from nematocyst-like capsules. M. cerebralis has been reported in Germany (1893), Italy (1954), USSR (1955), including Sakhalin Island (1960), U.S. (1958), Bulgaria (1960), Yugoslavia (1960), Sweden (1966), South Africa (1966), Scotland (1968), New Zealand (1971), Ecuador (1971), Norway (1971), Colombia (1972), Lebanon (1973), Ireland (1974), Spain (1981) and England (1981). This parasite was originally a mild pathogen of brown trout in central Europe and other salmonids in northeast Asia, and the spread of the rainbow trout has greatly increased its impact. Having no innate immunity to M. cerebralis, rainbow trout are particularly susceptible, and can release so many spores that even more resistant species in the same area, such as Salmo trutta, can become overloaded with parasites and incur mortalities of 80 to 90 percent. Where M. cerebralis has become well-established, it has caused decline or even elimination of whole cohorts of fish. The parasite M. cerebralis was first recorded in North America in 1956 in Pennsylvania, but until the 1990s whirling disease was considered a manageable problem only affecting rainbow trout in hatcheries. It eventually became established in natural waters of the Rocky Mountain states (Colorado, Wyoming, Utah, Montana, Idaho, New Mexico), where it is damaging several sport fishing rivers. Some streams in the western U.S. lost 90 percent of their trout. Whirling disease threatens recreational fishing, which is important for the tourism industry, a key component of the economies of some U.S. western states. For example, in 2005 anglers in Montana spent approximately $196,000,000 in activities directly related to trout fishing in the state. Some of the salmonids that M. cerebralis infects (bull trout, cutthroat trout, and anadromous forms of rainbow trout—steelhead) are already threatened or endangered, and the parasite could worsen their population decline. The New Zealand mud snail (Potamopyrgus antipodarum), once endemic to New Zealand, has spread widely and has become naturalised and an invasive species in many areas including Australia, Asia (Japan, in the Garmat Ali River in Iraq since 2008), Europe (since 1859 in England), and North America (U.S. and Canada: Thunder Bay in Ontario since 2001, British Columbia since July 2007), most likely inadvertently during human activity. It can reach concentrations greater than 500,000 per square metre (46,000/sq ft), endangering the food chain by outcompeting native snails and water insects for food, leading to sharp declines in native populations. There is evidence North American fishes are unable to digest the tiny but hard shells of the mud snail, and that their presence may result in poor growth outcomes for rainbow trout. The mud snail was first detected in the U.S. in Idaho's Snake River in 1987. Since then, the snail has spread to the Madison River, Firehole River, and other watercourses around Yellowstone National Park, and has been discovered throughout the western U.S. The exact means of transmission is unknown, but it is likely that it was introduced in water transferred with live game fish and has been spread by ship ballast or contaminated recreational equipment such as wading gear. Didymosphenia geminata, commonly known as didymo or rock snot, is a species of diatom that produces nuisance growths in freshwater rivers and streams with consistently cold water temperatures. In New Zealand, invasive didymo can form large mats on the bottom of rivers and streams in late winter. It is not considered a significant human health risk, but it can affect stream habitats and sources of food for fish, including rainbow trout, and make recreational activities unpleasant. Even though it is native in North America, it is considered a nuisance organism or invasive species. Enteric redmouth disease is a bacterial infection of freshwater and marine fish caused by the pathogen Yersinia ruckeri. It is primarily found in rainbow trout and other cultured salmonids. The disease is characterized by subcutaneous hemorrhaging of the mouth, fins, and eyes. It is most commonly seen in fish farms with poor water quality. Redmouth disease was first discovered in Idaho rainbow trout in the 1950s. Some fisheries are focused on removing rainbow trout in order to reestablish native trout populations. This can be done by poisoning rivers with chemicals such as antimycin or rotenone which have been declared safe in the USA by the Environmental Protection Agency. Once the chemicals have dissipated, native trout are released into the river. Another method is to use electrofishing which enable the fish to be caught alive and harvested or re-located. This technique has been used in the Great Smokey Mountains National Park to rid it of rainbow trout that were introduced in the 1930s and have thrived ever since. They are hoping to re-establish native brook trout in at least some of the 2100-mile river system. Neither method of control is 100% effective and are best regarded as methods to change the relative population sizes of fish species. Steelhead populations in parts of its native range have declined due to a variety of human and natural causes. While populations in Alaska and along the British Columbia coast are considered healthy, populations in Kamchatka and some populations along the U.S. west coast are in decline. The U.S. National Marine Fisheries Service has 15 identified distinct population segments (DPS)s, in Washington, Oregon, and California. Eleven of these DPSs are listed under the U.S. Endangered Species Act, ten as threatened and one as endangered. One DPS on the Oregon Coast is designated a U.S. Species of Concern. The Southern California DPS, which was listed as endangered in 2011, has been affected by habitat loss due to dams, confinement of streams in concrete channels, water pollution, groundwater pumping, urban heat island effects, and other byproducts of urbanization. Steelhead in the Kamchatka Peninsula are threatened by over-harvest, particularly from poaching and potential development, and are listed in the Red Data Book of Russia that documents rare and endangered species. Several studies have shown that almost all California coastal steelhead are of native origin, despite over a century of hatchery stocking. Genetic analysis shows that the South Central California Coast DPS and Southern California DPS from Malibu Creek north, and including the San Gabriel River, Santa Ana River and San Mateo Creek, are not hatchery strains. Steelhead from Topanga Creek and the Sweetwater River were partly, and those from San Juan Creek completely, of hatchery origin. Genetic analysis has also shown that the steelhead in the streams of the Santa Clara County and Monterey Bay basins are not of hatchery origin, including the Coyote Creek, Guadalupe River, Pajaro River, Permanente Creek, Stevens Creek, San Francisquito Creek, San Lorenzo River, and San Tomas Aquino Creek basins. Natural waterfalls and two major dams have isolated Russian River steelhead from freshwater rainbow trout forms above the impassable barriers; a 2007 genetic study of fin samples collected from steelhead at 20 different sites both above and below passage barriers in the watershed found that although 30 million hatchery trout were stocked in the river from 1911 to 1925, the steelhead remain of native and not hatchery origin. Releases of conventionally reared hatchery steelhead pose ecological risks to wild steelhead populations. Hatchery steelhead are typically larger than the wild forms and can displace wild-form juveniles from optimal habitats. Dominance of hatchery steelhead for optimal microhabitats within streams may reduce wild steelhead survival as a result of reduced foraging opportunity and increased rates of predation. Rainbow trout are a popular game fish for fly fishers. Rainbow trout and steelhead are highly regarded game fish. Rainbow trout are a popular target for fly fishers, and several angling methods are used. The use of lures presented via spinning, casting or trolling techniques is common. Rainbow trout can also be caught on various live and dead natural baits. The International Game Fish Association recognizes the world record for rainbow trout as a fish caught on Saskatchewan's Lake Diefenbaker by Sean Konrad on September 5, 2009. The fish weighed 48 lb (22 kg) and was a genetically modified hatchery escapee. Many anglers consider the rainbow trout the hardest-fighting trout species, as this fish is known for leaping when hooked and putting up a powerful struggle. It is considered one of the top five sport fish in North America and the most important game fish west of the Rocky Mountains. There are tribal commercial fisheries for steelhead in Puget Sound, the Washington coast and in the Columbia River, but there has been controversy regarding over-harvesting of native stocks. The highly desirable sporting qualities and adaptability of the rainbow trout to hatchery rearing and new habitats resulted in it being introduced to many countries around the world by or at the behest of sport fishermen. Many of these introductions have resulted in environmental and ecological problems, as the introduced rainbow trout disrupt local ecosystems and outcompete or eat indigenous fishes. Other introductions to support sport angling in waters either devoid of fish or with seriously depleted native stocks have created world-class fisheries such as in the Firehole River in Yellowstone National Park, and in the Great Lakes. Rainbow trout is popular in Western cuisine; both wild-caught and farmed fish are eaten. It has tender flesh and a mild, somewhat nutty flavor. Wild fish has a stronger, gamier taste than farmed fish. While the taste of wild-caught trout is often promoted as superior, rainbow trout and "steelhead" sold in American restaurants is farmed. Farmed rainbow are considered one of the safest fish to eat and are noted for high levels of vitamin B and a generally appealing flavor. Seafood Watch ranks farmed rainbow as a "Best Choice" fish for human consumption. In Montana, it is illegal to sell or market wild-caught rainbow trout, which are legally classified as game fish. The color and flavor of the flesh depends on the diet and freshness of the trout. Farmed trout and some populations of wild trout, especially anadromous steelhead, have reddish or orange flesh as a result of high astaxanthin levels in their diets. Astaxanthin is a powerful antioxidant that may be from a natural source or a synthetic trout feed. Rainbow trout raised to have pinker flesh from a diet high in astaxanthin are sometimes sold in the U.S. with labeling calling them "steelhead". As wild steelhead are in decline in some parts of their range, farmed rainbow are viewed as a preferred alternative. In Chile and Norway, rainbow trout farmed in saltwater sea cages are sold labeled as steelhead. Trout can be cooked as soon as they are cleaned, without scaling, skinning or filleting. If cooked with the skin on, the meat tends to hold together better. While trout sold commercially in Europe is often prepared and served this way, most trout sold commercially in the U.S. have had heads removed and have been fully or partially deboned and filleted. Medium to heavy bodied white wines, such as chardonnay, sauvignon blanc or pinot gris are typical wine pairings for trout. ^ "Synonyms of Oncorhynchus mykiss (Walbaum, 1792)". Fishbase. Retrieved 2014-02-06. ^ "Symbols of Washington State". Washington State Legislature. Retrieved 2013-11-29. ^ a b Behnke, Robert J. (2002). "Rainbow and Redband Trout". Trout and Salmon of North America. Tomelleri, Joseph R. (illustrator). New York: The Free Press. p. 67. ISBN 978-0-7432-2220-4. ^ a b c Behnke, Robert J. (2002). "Genus Oncorhynchus". Trout and Salmon of North America. Tomelleri, Joseph R. (illustrator). New York: The Free Press. pp. 10–21. ISBN 978-0-7432-2220-4. ^ Richardson, John; Swainson, William; Kirby, William (1836). "Fauna Boreali-Americana, or, The Zoology of the Northern Parts of British America: Containing Descriptions of the Objects of Natural History Collected on the Late Northern Land Expeditions, Under Command of Captain Sir John Franklin, R.N. (1829) Part Third: The Fish". London: Richard Bentley. p. 221. OCLC 257860151. ^ "Invertebrate Zoology and Geology". California Academy of Sciences. Archived from the original on 2013-12-12. Retrieved 2013-12-16. ^ Behnke, Robert J. (1966). "Relationships of the Far Eastern Trout, Salmo mykiss Walbaum". Copeia. 1966 (2): 346–348. doi:10.2307/1441145. JSTOR 1441145. ^ Smith, Gerald R.; Stearley, Ralph F. (1989). "The Classification and Scientific Names of Rainbow and Cutthroat Trouts". Fisheries. 14 (1): 4–10. doi:10.1577/1548-8446(1989)014<0004:TCASNO>2.0.CO;2. ^ a b Behnke, Robert J. (2002). "Rainbow and Redband Trout". Trout and Salmon of North America. Tomelleri, Joseph R. (illustrator). New York: The Free Press. pp. 65–122. ISBN 978-0-7432-2220-4. ^ a b Meyer, J.; Fradkin, S. (2002). "Summary of Fisheries and Limnological Data for Lake Crescent, Washington". Olympic National Park Report. Port Angeles, Washington. ^ Rasmussen, Joseph B.; Taylor, Eric B. (2009). "Status of the Athabasca Rainbow Trout Oncorhynchus mykiss in Alberta" (PDF). Government of Alberta-Fish and Wildlife Division. Archived from the original (PDF) on 2014-02-21. Retrieved 2013-11-29. ^ "Little Kern Golden Trout" (PDF). SOS: California's Native Fish Crisis. California Trout. p. 74. Retrieved 2014-01-02. ^ McCoy, John (2013-05-11). "50 Years Later, Golden Rainbows Still 'a Treat' for Mountain State Fishermen". Saturday Gazette-Mail. Charleston, West Virginia. Retrieved 2013-12-29. ^ a b c "Golden Rainbow Trout". Pennsylvania Fish and Boat Commission FAQ. Archived from the original on 2013-11-27. Retrieved 2013-11-28. ^ "Golden Rainbow Trout". Retrieved 2013-11-28. ^ Behnke, Robert J. (2002). "Rainbow and Redband Trout". Trout and Salmon of North America. Tomelleri, Joseph R. (illustrator). New York: The Free Press. pp. 88, 106. ISBN 978-0-7432-2220-4. ^ Behnke, Robert J. (2002). "Cutthroat trout Oncorhynchus clarki". Trout and Salmon of North America. Tomelleri, Joseph R. (illustrator). The Free Press. p. 139. ISBN 978-0-7432-2220-4. ^ "Rainbow Trout Fin Clips" (PDF). Minnesota Department of Natural Resources. Retrieved 2013-12-30. ^ "Questions and Answers about the Fin Clip Fishery in Hills Creek Reservoir" (PDF). Oregon Department of Fish and Wildlife. Retrieved 2013-12-01. ^ a b c Behnke, Robert J. (2002). "Rainbow and Redband Trout". Trout and Salmon of North America. Tomelleri, Joseph R. (illustrator). New York: The Free Press. pp. 68–72. ISBN 978-0-7432-2220-4. ^ "List of Population Characteristics records for Oncorhynchus mykiss". Fishbase. Retrieved 2014-02-23. ^ "Steelhead Fishing in Lake Erie Tributaries". New York State Department of Environmental Conservation. Retrieved 2014-02-03. ^ a b Staley, Kathryn; Mueller, John (May 2000). "Rainbow Trout (Oncorhynchus mykiss)" (PDF). U.S. Department of Agriculture. Retrieved 2013-12-16. ^ "Wisconsin Trout Fishing: Trout Stream Classifications". Wisconsin Department of Natural Resources. 2014-01-27. Retrieved 2014-01-03. ^ "Steelhead/Rainbow Trout Species Profile". Alaska Department of Fish and Game. Retrieved 2013-08-26. ^ "Mariculture in Tasmania Ocean Trout". Marine Education Association of Australasia. Retrieved 2014-02-23. ^ Behnke, Robert J. (2002). "Rainbow and Redband Trout". Trout and Salmon of North America. Tomelleri, Joseph R. (illustrator). New York: The Free Press. p. 70. ISBN 978-0-7432-2220-4. ^ Hale, MC; Thrower, FP; Berntson, EA; Miller, MR; Nichols, KM (August 2013). "Evaluating Adaptive Divergence Between Migratory and Nonmigratory Ecotypes of a Salmonid Fish, Oncorhynchus mykiss". G3: Genes, Genomes, Genetics. 3 (8): 1273–1285. doi:10.1534/g3.113.006817. PMC 3737167. PMID 23797103. ^ "Recreational Salmon Fishing Salmon/Steelhead Species Information Steelhead (Rainbow Trout) Oncorhynchus mykiss". Washington Department of Fish and Wildlife. Retrieved 2014-01-07. ^ "BC Fish Facts-Steelhead" (PDF). British Columbia Ministry of Fisheries. Archived from the original (PDF) on 2013-07-18. Retrieved 2013-11-28. ^ Behnke, Robert J. (2002). "Rainbow and Redband Trout". Trout and Salmon of North America. Tomelleri, Joseph R. (illustrator). New York: The Free Press. p. 117. ISBN 978-0-7432-2220-4. ^ Behnke, Robert J. (2002). "Rainbow and Redband Trout". Trout and Salmon of North America. Tomelleri, Joseph R. (illustrator). New York: The Free Press. pp. 82–83. ISBN 978-0-7432-2220-4. ^ Fuller, Pam L.; Nico, Leo G.; Williams, James D. (1999). "Case Study: Rainbow Trout". Nonindigenous Fishes Introduced into Inland Waters of the United States. Bethesda, Maryland: American Fisheries Society. pp. 250–251. ISBN 978-1-888569-14-8. OCLC 41262458. ^ Schley, Ben (2009-05-21). "A Century of Fish Conservation (1871–1971)". U.S. Fish and Wildlife Service. Retrieved 2013-11-28. ^ Behnke, Robert J.; Williams, Ted (2007). About Trout: The Best of Robert J. Behnke from Trout Magazine. Globe Pequot. pp. 6–7. ISBN 978-1-59921-203-6. ^ "Fish and Aquatic Conservation". U.S. Fish and Wildlife Service. Retrieved 2013-11-28. 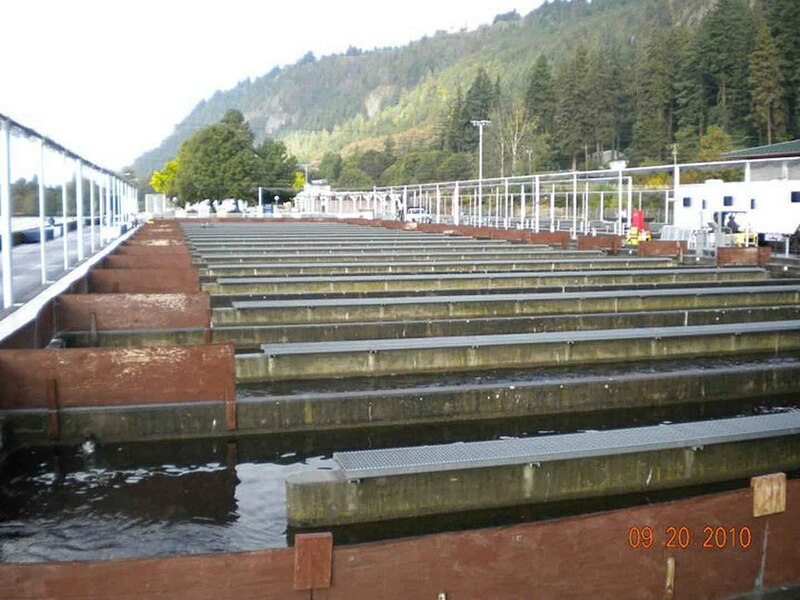 ^ "Conservation-Salmon Hatcheries Overview". Washington Department of Fish and Wildlife. Retrieved 2013-11-28. ^ Frye, Jason. "The Cherokee Tribal Fish Hatchery". Our State magazine. Retrieved 2013-11-28. ^ Burden, Dan (March 2012). "Trout Profile". Agricultural Resource Marketing Center. Archived from the original on 2013-12-03. Retrieved 2013-11-29. ^ "Farmed Rainbow Trout / Steelhead Salmon". Agriculture and Agri-Food Canada. Retrieved 2014-08-12. ^ a b c d e f g h O'Neill, Brendan (2006-06-23). "Seafood Watch Report: Farmed Rainbow Trout" (PDF). Monterey Bay Aquarium. pp. 2–6. Archived from the original (PDF) on 2014-01-07. Retrieved 2014-01-06. ^ a b c "Cultured Aquatic Species Information Programme: Oncorhynchus mykiss (Walbaum, 1792)". Food and Agricultural Organization of the United Nations, Fisheries and Aquaculture Department. Retrieved 2014-01-09. ^ Macleod, Roderick (2014-10-28). "Trout farming in land-locked Lesotho is an export success". BBC News. Retrieved 2014-11-02. ^ a b c "Seafood Watch: Rainbow Trout". Monterey Bay Aquarium. Archived from the original on 2014-01-07. Retrieved 2014-01-06. ^ a b Egan, Timothy (1998-02-25). "Trout as Wild as All Outdoors, Almost". The New York Times. Retrieved 2014-01-06. ^ a b c d Harlow, Jay. "Dependable, Delectable Rainbow Trout". Sally's Place. Retrieved 2013-11-28. ^ Bullock, G. L.; Cipriano, R.C. (1990). "Enteric Redmouth Disease of Salmonids LSC". Fish Disease Leaflet 82. U.S. Fish and Wildlife Service. Archived from the original on 2009-06-16. ^ "Species Profile: Steelhead". U.S. Fish and Wildlife Service. Archived from the original on 2013-12-03. Retrieved 2013-11-29. ^ "Whole Effluent Toxicity". Environmental Protection Agency. 2013-09-12. Retrieved 2013-11-29. ^ "Circle Creek Fish Passage Project". Trout Unlimited. Retrieved 2014-01-04. ^ "Steelhead Project Report". Wild Salmon Center. November 2004. Archived from the original on 2014-03-06. Retrieved 2013-12-01. ^ "About Us". California Trout. Retrieved 2013-12-01. ^ "About Us". The Steelhead Society of British Columbia. Retrieved 2013-12-01. ^ "Truchas Mexicanas". Retrieved 2014-02-12. ^ Parker, David; Avers, Thomas; Courtney, Michael (2011). "Weight, Length, and Growth in Cutbow Trout (O. m. x clarkii)" (PDF). Nature Precedings. doi:10.1038/npre.2011.6432.1. Retrieved 2014-01-04. ^ Allendorf, Fred W.; Leary, Robb F.; Hitt, Nathaniel P.; Knudsen, Kathy L.; Lundquist, Laura L. & Spruell, Paul (October 2004). "Intercrosses and the U.S. Endangered Species Act: Should Hybridized Populations be Included as Westslope Cutthroat Trout?" (PDF). Conservation Biology. Washington, D.C. 18 (5): 1203–1213. doi:10.1111/j.1523-1739.2004.00305.x. ^ Dickson, Tom. "Montana's Redband Trout". Montana Outdoors. Montana Fish, Wildlife & Parks (May–June 2011). Retrieved 2013-11-29. ^ "Kern River Rainbow Trout" (PDF). Cal Trout. Retrieved 2014-03-03. ^ "California Golden Trout" (PDF). Cal Trout. Retrieved 2014-03-03. ^ "Whirling Disease Initiative: Final Report" (PDF). Montana Water Center, Montana State University. October 2009. p. 1. Archived from the original (PDF) on 2012-07-17. Retrieved 2013-12-30. ^ Elwell, Leah C. Steinbach; Stromberg, Kajsa Eagle; Ryce, Eileen K.N. ; Bartholomew, Jerri L. "Whirling Disease in the United States – A Summary of Progress in Research and Management 2009". Whirling Disease Foundation, Trout Unlimited. Retrieved 2013-12-31. ^ a b Faisal, Mohamed; Garling, Donald (December 2004). "What Is Whirling Disease?" (PDF). North Central Regional Aquaculture Center and Michigan State University Extension. Archived from the original (PDF) on 2014-01-01. Retrieved 2013-12-31. ^ Tennyson, J.; Anacker, T.; Higgins, S. (January 13, 1997). "Scientific Breakthrough Helps Combat Trout Disease". U.S. Fish and Wildlife Service Whirling Disease Foundation News Release. Retrieved 2014-01-05. ^ "Montana's Wild Trout". The Trout Conservancy. Archived from the original on 2014-01-01. ^ Gilbert, M. A.; Granath, W. O. Jr. (2003). "Whirling Disease and Salmonid Fish: Life Cycle, Biology, and Disease". Journal of Parasitology. 89 (4): 658–667. doi:10.1645/GE-82R. JSTOR 3285855. PMID 14533670. ^ "Datasheet: Potamopyrgus antipodarum (New Zealand mudsnail)". Invasive Species Compendium. Centre for Agriculture and Bioscience International. Retrieved 2012-12-04. ^ a b Davidson, Timothy M.; Brenneis, Valance E. F.; de Rivera, Catherine; Draheim, Robyn; Gillespie, Graham E. (2008). "Northern Range Expansion and Coastal Occurrences of the New Zealand Mud Snail Potamopyrgus antipodarum (Gray, 1843) in the Northeast Pacific" (PDF). Aquatic Invasions. 3 (3): 349–353. doi:10.3391/ai.2008.3.3.12. ^ Naser, Murtada D.; Son, Mikhail O. (2009). "First Record of the New Zealand Mud Snail Potamopyrgus antipodarum (Gray 1843) from Iraq: the Start of Expansion to Western Asia?" (PDF). Aquatic Invasions. 4 (2): 369–372. doi:10.3391/ai.2009.4.2.11. ^ a b Benson, A. J.; Kipp, R. M.; Larson, J.; Fusaro, A. (2013). "Potamopyrgus antipodarum". USGS Nonindigenous Aquatic Species Database. U.S. Geological Survey. Retrieved 2013-05-25. ^ Benson, Amy (2006). "New Zealand Mudsnail: Potamopyrgus antipodarum". Florida Integrated Science Center. Archived from the original on 2006-02-19. Retrieved 2006-05-04. ^ Vinson, M. R.; Baker, M. A. (2008). "Poor growth of rainbow trout fed New Zealand mud snails Potamopyrgus antipodarum". North American Journal of Fisheries Management. 28 (3): 701–709. doi:10.1577/M06-039.1. ^ "Aquatic Nuisance Project Fact Sheet: New Zealand Mudsnail (Potamopyrgus antipodarum)". Aquatic Nuisance Species Project. Retrieved 2014-01-03. ^ "DPIPWE - Didymo (Rock Snot)". Tasmania Department of Primary Industries, Parks, Water and Environment. Archived from the original on 2015-03-08. Retrieved 2014-08-12. ^ Biosecurity New Zealand (August 2007). "Is Didymo an Exotic Species?". Biosecurity New Zealand. Archived from the original on 2013-12-03. Retrieved 2013-12-01. ^ "Invasive Aquatic Species-Didymo". U.S. Department of Agriculture. Retrieved 2013-12-16. ^ Busch, R. A. (March 1978). "MFR Paper 1296 Enteric Redmouth Disease (Haggerman Strain)" (PDF). Marine Fisheries Review. 40 (3). Retrieved 2014-01-05. ^ "Native Trout Are Returning to America's Rivers". Smithsonian. Retrieved 2016-05-03. ^ a b "Steelhead Trout (Oncorhynchus mykiss)". NOAA Fisheries, Office of Protected Resources. Retrieved 2013-11-28. ^ "Appendix D Evolutionarily Significant Units, Critical Habitat, and Essential Fish Habitat" (PDF). California Department of Water Resources. Retrieved 2013-11-29. ^ Rahr III, Guido. "Bountiful Breed: Kamchatka Siberia's Forbidden Wilderness". Public Broadcasting System (PBS). Retrieved 2013-12-04. ^ Clemento, Anthony J.; Anderson, Eric C.; Boughton, David; Girman, Derek; Garza, John Carlos (2009). "Population Genetic Structure and Ancestry of Oncorhynchus mykiss Populations Above and Below Dams in South-central California" (PDF). Conservation Genetics. 10 (5): 1321–1336. doi:10.1007/s10592-008-9712-0. Retrieved 2014-01-03. ^ McMichael, G. A.; Pearsons, T. N.; Leider, S. A. (1999). "Behavioral Interactions Among Hatchery-reared Steelhead Smolts and Wild Oncorhynchus mykiss in Natural Streams". North American Journal of Fisheries Management 19. 19 (4): 948–956. doi:10.1577/1548-8675(1999)019<0948:BIAHRS>2.0.CO;2. ^ Keim, Brandon (2009-09-15). "48-Pound Trout: World Record or Genetic Cheat?". Wired. Retrieved 2013-11-29. ^ Waterman, Charles F. (1971). The Fisherman's World. New York: Random House. p. 57. ISBN 978-0-394-41099-9. OCLC 319916607. ^ Stellmon, Josh (2008). "Under the Guise of 'Treaty Rights:' The Nez Perce Tribe of Idaho, Steelhead, and Gillnetting". Public Land and Resources Law Review. 29. Retrieved 2014-01-05. ^ "100 of the World's Worst Invasive Alien Species". Invasive Species Specialist Group (ISSG) of the IUCN Species Survival Commission. Retrieved 2013-11-28. ^ Brooks, Charles E. (1979). The Living River: A Fisherman's Intimate Profile of the Madison River Watershed—Its History, Ecology, Lore and Angling Opportunities. Garden City, New Jersey: Nick Lyons Books. pp. 56–59. ISBN 978-0-385-15655-4. OCLC 5751574. ^ The Yellowstone Fly-Fishing Guide. Guilford, CT: The Globe Pequot Press. 1997. p. 11. ISBN 978-1-55821-545-0. In 1994 Yellowstone Park official introduced a fee permit policy to help pay the increased cost of protecting and enhancing this world-class fishery. ^ Santella, Chris (2004). "Brown and Rainbow trout on the Madison River". Fifty Places to Fly Fish Before You Die: Fly Fishing Experts Share The World's Greatest Destinations. Harry M. Abrams Inc. ISBN 978-1-58479-356-4. ... thanks to the Firehole's geothermal activity, the river bottom undulates with plant life. Few fish are caught here and tourists continue on to the West Yellowstone park exit, thinking that its too bad there are no fish in that pretty river that skirts the road. Little do they know that they have been following one of the most fabled trout streams in the world! ^ "Fishing New York's Great Lakes". New York State Department of Environmental Conservation. Retrieved 2013-11-28. ^ a b c Wright, Leonard M. (1996). Trout Maverick. New York: Lyons & Burford. p. 19. ISBN 978-1-55821-476-7. ^ Cancila, Katherine (2010-09-16). "The 5 Safest Fish to Eat – Salmon, Tilapia, Rainbow Trout and More". Babble. Disney. Retrieved 2014-01-06. ^ "§87-6-206, Montana Code Annotated". Montana Legislative Services. 2014. Retrieved 2014-01-06. ^ "§87-6-707, Montana Code Annotated". Montana Legislative Services. 2014. Retrieved 2014-01-06. ^ "§87-6-101, Montana Code Annotated". Montana Legislative Services. 2014. Retrieved 2014-01-06. ^ "Pairing Wine with Fish". Wine Folly. May 20, 2013. Retrieved 2014-02-15. Combs, Trey (1976). Steelhead Fly Fishing and Flies. Portland, Oregon: Frank Amato. ISBN 978-0-936608-03-7. Combs, Trey (1991). Steelhead Fly Fishing. New York: Lyons and Burford Publishers. ISBN 978-1-55821-119-3. Gerlach, Rex (1988). Fly Fishing for Rainbows-Strategies and tactics for North America's Favorite Trout. Mechanicsburg, Pennsylvania: Stackpole Books. ISBN 978-0-8117-0624-7. Marshall, Mel (1973). Steelhead. New York: Winchester Press. ISBN 978-0-87691-093-1. McClane, A. J.; Gardner, Keith (1984). "Rainbow Trout and Steelhead". McClane's Game Fish of North America. New York: Times Books. pp. 54–93. ISBN 978-0-8129-1134-3. Montaigne, Fen (1998). "Kamchatka". Reeling in Russia. New York: St. Martins Press. pp. 251–270. ISBN 978-0-312-18595-4. Froese, Rainer and Pauly, Daniel, eds. (2006). "Oncorhynchus mykiss" in FishBase. February 2006 version. "Oncorhynchus mykiss". Integrated Taxonomic Information System. Retrieved 2006-01-30. The Baja California rainbow trout or San Pedro Martir trout or Nelson's trout (Oncorhynchus mykiss nelsoni) is a localized subspecies of the rainbow trout (Oncorhynchus mykiss), a freshwater fish in the Salmonidae family. Baja California rainbow trout is one of many species of Mexican native trout. East Caroga Lake is located in the Town of Caroga by Caroga Lake, New York. The lake provides excellent warm water fishing and rainbow trout fishing. The lake is connected to West Caroga Lake by a small channel. Origin of the name, "Caroga" is derived from the once nearby Indian Village known as "Caroga". Enteric redmouth disease, or simply redmouth disease is a bacterial infection of freshwater and marine fish caused by the pathogen Yersinia ruckeri. It is primarily found in rainbow trout (Oncorhynchus mykiss) and other cultured salmonids. The disease is characterized by subcutaneous hemorrhaging of the mouth, fins, and eyes. It is most commonly seen in fish farms with poor water quality. Redmouth disease was first discovered in Idaho rainbow trout in the 1950s. The disease does not infect humans. The more northerly of the two rivers called Esk River in New Zealand lies in Hawke's Bay, in the eastern North Island. One of the region's major rivers, it flows south from the slopes of Mount Taraponui in the Maungaharuru Range before turning east to reach Hawke Bay 10 kilometres (6 mi) north of Napier. State Highway 5 follows the lower course of the river for several kilometres close to the settlement of Eskdale. The river is probably named after the Esk River in southern Scotland and north-west England.The lower 19 kilometres (12 mi) of the Esk can be suitable for whitewater canoeing, but the flow needs to be above normal. Brown and rainbow trout are available in the river, but fishing is restricted.The southern stretch of the river forms the northern boundary for urban development in Napier. Hukarere Girls' College is located near the Esk River.Chardonnay and red wine grapes are grown in the Esk River valley. The class Flavobacteriia is composed of a single order of environmental bacteria. According to Bernardet et al., Flavobacteriia are Gram-negative aerobic rods, 2–5 µm long, 0.3–0.5 µm wide, with rounded or tapered ends that are motile by gliding, yellow (cream to orange) colonies on agar, decompose several polysaccharides but not cellulose, G+C contents of 32–37%, and are widely distributed in soil and fresh and seawater habitats. In particular, Flavobacteriia are prominent members of marine biofilms. The type species Flavobacterium aquatile was isolated from a well in Kent, England.Flavobacteriia are a group of commensal bacteria and opportunistic pathogens. Flavobacterium psychrophilum causes the septicemic diseases rainbow trout fry syndrome and bacterial cold water disease. The name is often spelled Flavobacteria, but officially named Flavobacteriia in 2012. Flavobacterium is a genus of gram-negative, nonmotile and motile, rod-shaped bacteria that consists of 130 recognized species. Flavobacteria are found in soil and fresh water in a variety of environments. Several species are known to cause disease in freshwater fish.F. psychrophilum causes the bacterial cold water disease on salmonids and the rainbow trout fry disease on rainbow trout. F. columnare causes the cotton-wool disease on freshwater fishes. F. branchiophilum causes the bacterial gill disease on trout. Another member of this genus, F. okeanokoites is the original source for the type IIs restriction endonuclease FokI, used in Zinc finger nucleases and TALENs.Nylon-eating bacteria are a strain of Flavobacterium that is capable of digesting certain by-products of nylon 6 manufacture. The California golden trout, or simply the golden trout (Oncorhynchus aguabonita), is a species of trout native to California. The golden trout is native to Golden Trout Creek (tributary to the Kern River), Volcano Creek (tributary to Golden Trout Creek), and the South Fork Kern River. It is the state fish of California. The California golden trout is closely related to two rainbow trout subspecies. The Little Kern golden trout (O. m. whitei), found in the Little Kern River basin, and the Kern River rainbow trout (O. m. gilberti), found in the Kern River system. Together, these three trout form what is sometimes referred to as the "golden trout complex". The Kamchatkan rainbow trout (Oncorhynchus mykiss mykiss) is a subspecies of the rainbow trout, which is a fish in the Salmonidae family. It is native to Russian Far East. Its main range is on the Kamchatka Peninsula, and it has also been recorded from the Commander Islands east of Kamchatka, and sporadically in the Sea of Okhotsk, as far south as the mouth of the Amur River. The Kern River rainbow trout (Oncorhynchus mykiss gilberti) is a localized subspecies of the rainbow trout (Oncorhynchus mykiss), a variety of fish in the family Salmonidae. It is found in a short section of the main stem of the Kern River and several tributaries in the southern Sierra Nevada mountains in California. The Kern River rainbow trout is a "Species of Special Concern" in the state of California due to habitat loss and hybridization with other native and non-native trout in their range.The Kern River rainbow trout is one of three subspecies of O. mykiss that are all endemic to the Kern River basin, sharing the headwaters of the river with the Little Kern golden trout and golden trout. Some of the existing range of the Kern River rainbow trout lies within the California Golden Trout Wilderness. San Leandro Creek (Spanish: Arroyo de San Leandro) is a 21.7-mile-long (34.9 km) year-round natural stream in the Berkeley Hills, in Alameda County and Contra Costa County of the East Bay in northern California. The Shepards River is a 13.6-mile-long (21.9 km) river in western Maine and eastern New Hampshire in the United States. It is part of the Saco River drainage basin. The Shepards River rises in the town of Eaton, New Hampshire, among foothills of the White Mountains. The river flows northeast into Brownfield, Maine, passing the villages of West Brownfield, Brownfield, and East Brownfield before reaching the Saco River east of Frost Mountain. Several species of game fish have been caught in Shepards River, including brook trout, rainbow trout, largemouth bass, and atlantic salmon. Steelhead trout is a name given to the anadromous form of the coastal rainbow trout (Oncorhynchus. m. irideus) or redband trout (O. m. gairdneri). The steelhead are native to freshwater and ocean environments across North America, but have been introduced to every other continent except Antarctica. Steelhead use aquatic obstructions like vegetation, boulders, and fallen trees as protection. Swimbaits are a loosely defined class of fishing lures that imitate fish and tend to be distinct in design from a typical crankbait.Swimbaits are usually different from crankbaits by the way they generate lure action. Some are rubber "paddle tail" lures that appear to swim when the tail flutters during retrieve. Some are jointed baits that wave like a flag in the water when retrieved, without any obvious mechanism to generate motion. Some are large jointed crankbaits or crankbait/plastic lure hybrids. The term swimbait is often used to indicate plastic "paddle tail" lures, regardless of size or appearance. Trout Lake is located in Warren County, New York. The lake has many different species of fish, and is stocked regularly by the NYSDEC. It is called Trout Lake due to the high numbers of lake trout and rainbow trout that are found in the lake. Wallum Lake is a 322-acre (1.30 km2) lake that lies in Burrillville, Providence County, Rhode Island and Douglas, Worcester County, Massachusetts. It is adjacent to Douglas State Forest and Wallum Lake Park. There are two paved boat ramps: one at the north end off Wallum Lake Road, Douglas, Massachusetts, the second at the southern extreme in Burrillville, Rhode Island. A study reported ten species of fish, based upon a 1994 summer sampling. Largemouth bass, yellow perch and bluegills are common. Additional species present included pumpkinseed, chain pickerel, landlocked alewife, brood salmon and eels. Licenses from either state are valid, but Rhode Island regulations apply.Wallum Lake has been stocked with rainbow trout and brown trout. Rainbow trout are stocked on a put-and-take basis, and the state of Rhode Island has stocked numerous landlocked salmon and occasionally broodstock salmon. Webster Lake is a 606-acre (2.45 km2) water body in Merrimack County in the central portion of the U.S. state of New Hampshire, in the city of Franklin. Water from Webster Lake flows to the Pemigewasset River shortly above its confluence with the Winnipesaukee River to form the Merrimack. Webster Lake has two public beaches operated by the city of Franklin, one on either side of the lake. Webster Lake is surrounded by forests, and roads follow most of the lakeshore, allowing frequent views. There is boating access adjacent to Lagace Beach on New Hampshire Route 11. The lake is classified as a warmwater fishery, with observed species including rainbow trout, brown trout, smallmouth and largemouth bass, chain pickerel, horned pout, and white perch. William M. Tugman State Park is a state park in the U.S. state of Oregon. Administered by the Oregon Parks and Recreation Department (OPRD), the park borders Eel Lake, about 8 miles (13 km) south of Reedsport near U.S. Route 101.Tugman Park has 94 campsites for recreational vehicles (RVs) as well as 16 yurts for hikers and bikers; a day-use area, a boat ramp, a fishing dock, and a hiking trail. Activities on or near the lake include fishing, swimming, boating, and wildlife watching. The lake supports populations of largemouth bass, crappie, stocked rainbow trout, steelhead (sea-run rainbow trout), and Coho salmon, the latter of which must be released if caught.William M. Tugman (1894–1961) was a journalist from Eugene and Reedsport. In 1957, he became the first chairman of the OPRD Advisory Committee, which made recommendations to the governor about state parks.